1. BRENT crude futures with various expiration dates are traded on the Intercontinental Exchange located in London (ICE Futures Europe). As an example for the construction of our CFD we have selected three futures with the nearest expiration dates. ICE issues a large number of crude oil futures with 5 years expiration date, i.e., each future is traded for 5 years, but only a few contracts with the nearest expiration dates can be considered liquid. Thus, several relatively liquid futures with different expiration dates (and delivery) can be traded at the same time, but the most liquid ones are still the next nearby two futures. These futures are traded on business (trading) days according to the trading hours 02:00 - 24:00 CET (02:00 - 22:00 on Fridays). Contracts cease being traded about a month before the delivery date , which usually takes place in the middle of the month, e.g., March futures will be traded until the mid-February. As a rule, the price of the next futures contract remains either higher the nearby contract price, or lower than this price for quite a long time. 2. For an example let us take three 2015’s futures contracts: BRN5J (April), BRN5K (May) and BRN5M (June). These futures appear as Futures 1, Futures 2 and Futures 3 (see Fig. 1). Futures prices are adjusted to achieve a better visual clarity. As a result, the continuous CFD price is between the prices F1 and F2. Moreover, at the beginning of the time interval T, the CF price is close to F1 price, and as the trade close date of the nearby futures approaches, CF price gets close to the next contract price – F2. When there are only a few days left until the trade close of the nearby futures contract (“End trade 1” time, see Fig. 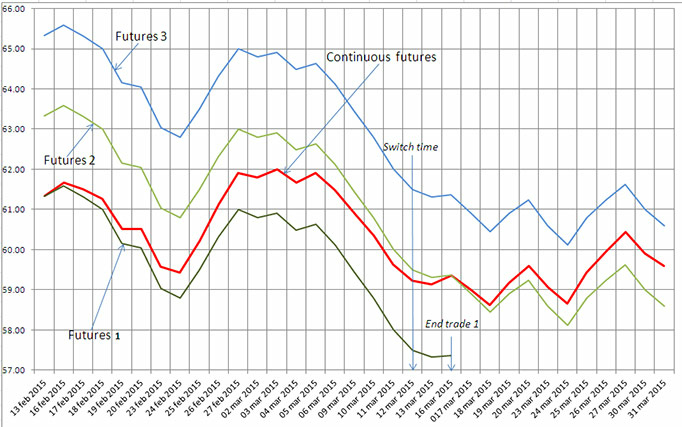 1) and the third futures contract’s liquidity reaches a sufficient level, calculation automatically switches to the next couple of futures, i.e., to Futures 2 and Futures 3 (“Switch time”, see Fig. 1) . Please note that the formula mentioned above is simplified and the operating algorithm takes certain peculiarities into account, including the calculation for a new pair of futures a few days before the T time slot starts. As a result, there are no gaps on price charts of a continuous CFD when switching to the next couple of futures. Clients of IFC Markets may hold positions in continuous commodity CFDs as long as they want to. Moreover, the company hedges positions of their clients by exchange futures, closing, if necessary, the hedged positions in nearby futures and reopening positions in next futures. Price movement of continuous CFD towards the futures with more distant expiration, calculated in formula, is compensated by higher cost of rollover (SWAP). This technique allows trading commodity CFDs at ease without worrying about expiration dates of futures contracts.